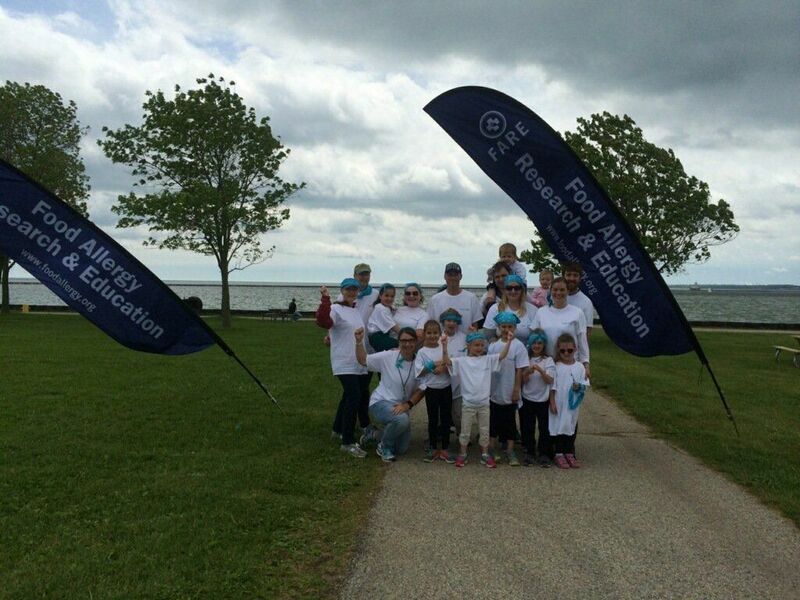 A group of 21 Associated Bank colleagues recently Associated Bank colleagues, friends and family members participate in an annual walk for Food Allergy Research & Education (FARE) at Veterans Park near the lakefront in Milwaukee. FARE is a national nonprofit organization working on behalf of the 15 million Americans with food allergies, including all those at risk for life-threatening anaphylaxis. This potentially deadly disease affects 1 in every 13 children in the U.S. – or roughly two in every classroom. FARE’s mission is to improve the quality of life and the health of individuals with food allergies, and to provide them hope through the promise of new treatments. The name of Associated’s team was “Team Delly” in reference to the nickname of Adel, who is the daughter of Kara Schneider, senior administrative assistant and project coordinator of Associated Investment Services at Associated Bank. Adel was diagnosed with a severe food allergy when she was a baby. Her older sister, Eva, was selected to sing the National Anthem at the start of the walk. Over 500 people were in attendance, including the Milwaukee Wave soccer team. “Team Delly” raised $3,775, and was ranked number one regionally and third nationally for their fundraising efforts. At the Neenah Main branch where Schneider works, colleagues raised $250 for FARE by selling dress-down stickers and holding a potluck lunch. In addition to the walk, FARE chose Schneider’s family to represent them on July 1 as Governor Walker signed SB 139, the Epinephrine ‘Entity’ Law, which allows epinephrine auto-injectors to be stocked and used at authorized entities such as summer camps, colleges, daycare facilities, youth sports leagues, amusement parks, restaurants, businesses and sports arenas. Wisconsin is the 16th State to allow public places, other than schools, to stock epinephrine auto-injectors for the treatment of anaphylaxis. Next year’s annual walk will be held on Saturday, June 16 at Veteran’s Park in Milwaukee. Visit the FARE website for more information: www.foodallergy.org.